Award-winning designer, Jo Thompson, returned to the RHS Chelsea Flower Show with a Main Avenue garden for show sponsor M&G Investments. 'The M&G Garden - The Retreat' had a beautifully-crafted, sturdy, double-storey, oak-framed building, a natural dipping pool and soft elegant planting. The garden also had two areas for sitting and resting; a curved wooden bench sunk into an area surrounded by flowers and a sleek stone bench at the water’s edge of the natural swimming pool. A number of different trees, including Betula nigra, Acer japonicum ‘Vitifolium’ and Robinia surrounded the oak-framed building. Soft elegant planting with swathes of roses, irises and geraniums swept through the garden, giving it a naturalistic feel and provided the perfect space to relax, cool off and enjoy the outdoors. Two stone sculptures by artist Tom Stogdon added to the garden’s creative ambience. 'The Beauty of Islam' was a garden designed to be a sanctuary in which to both relax and feel inspired. This garden was an RHS Chelsea Flower Show debut for Bin Zaal and Al Barari. The garden gave visitors the opportunity to explore the relationship between humankind and the earth, which is prominent in Islamic Culture. Planting and hard landscape patterns reflected those found within Islam. The poetry, calligraphy and textures within the garden reflected both the beauty of Arabic and Islamic cultures. A sculpture within the garden also represented Islamic art. Four walls acted as dividers within the garden, creating different rooms and enhancing the garden’s element of discovery with water flowing throughout. The wide variety of plants within the garden, including jasmine, rosemary and papyrus, represented the spread of Islam and Arab culture and the growth of the Arab empire through trade, most notably the Spice Route. The garden was Kamelia’s first show garden at Chelsea. 'The Brewin Dolphin Garden', created by Darren Hawkes, captured the fun and love of history and craftsmanship, with a space ideal for entertaining or private contemplation. Inspired by Neolithic dolmens and the work of artists such as James Turrell, the garden was somewhat calm yet exciting to explore. With floating platforms and naturalistic planting the Brewin Dolphin garden also had an underground stream, which eventually flowed into a pool. More than 40,000 pieces of hand-cut slate made up elevated ‘stepping stones’ over the garden’s gently flowing stream and woodland planting of ferns, aquilegia and bleeding heart. Elms were planted throughout the garden representing the trees that still grow in Cornwall, unaffected by Dutch Elm Disease, as well as Brewin Dolphin’s longevity as an investment management company. Visitors were reminded of country hedgerows and woodland clearings when they looked into this naturally wild garden. Harry and David Rich designed the Cloudy Bay Garden to reflect the tasting notes and characteristics of two of Cloudy Bay’s popular wines. It was a garden in which to enjoy wine, taking you from the dark and earthy tones of a Pinot Noir with planting in red, purples and plums to the floral, fresh and clean tones of a Sauvignon Blanc with light white and green planting. A moveable shack in the centre of the garden reflected the vineyard’s heritage, giving different perspectives of the garden, whatever the weather. Another aspect of the garden were water features portraying the clean crisp character of the white Sauvignon Blanc, together with oak that reflected the old wooden wine casks. This garden was John Tan and Raymond Toh’s debut at RHS Chelsea and was inspired by Kranji, a suburb of Singapore with a lush natural landscape home to tropical plants, orchid farms and nature reserve wetlands. Visitors to the show were transported to tropical Singapore. With palms, coconuts and fig flanking the garden, ferns created an oasis secreting an orchid display. This was a secret garden filled with vibrant tropical plants and orchids. The orchids drew the visitors views along the pathways, through the tropical planting and past a waterfall cascading over a green wall of ferns to a pond and house with a roof garden. Adam Frost returns to the RHS Chelsea Flower Show following a Gold medal win for Homebase with his design for 'Time to Reflect' in 2014. Taking inspiration from the work of modernist architect Marcel Breuer, the garden represented the balance of nature and the manmade environment. As a place for a small inner-city community to come together the garden included a lawn, water features and an arbour for people to enjoy the night sky. The three main materials were Portland cement concrete, corten steel and cedar, which reflected the imagined urban landscape. The planting was mainly ornamental and wildlife-friendly. 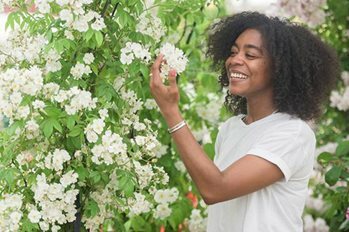 Homebase launched a ground-breaking Garden Academy Scheme in September 2013 to help raise the profile of a career in gardening and to inspire young people to get into gardening. A number of the young apprentices worked with Adam on his 2015 garden at Chelsea. Charlie Albone, an Australian-based designer, created his first RHS Chelsea Flower Show garden, a space to update his late father about his life since he passed away. Aged just 17 when he lost his father, Charlie had been keen to tell his father about his life. An emotive space, the garden had different sections, each telling the story. The first section celebrated life with beautiful, romantic planting; a water feature in the second section, was a space for reflection; and the third, at the rear of the garden, was an intimate space to sit, connect and communicate with loved ones. Varied textures and colours including silver, white, purple and pinks complemented the hard landscaping with planting to be enjoyed and supply interest all year round with a highlight in spring. For the 2015 show, Laurent-Perrier and Chatsworth came together to create a unique show garden, marking Chatsworth’s debut at Chelsea. The garden showed the heritage in gardens and nature, and family dwellings in beautiful grounds. Taking the prominent ‘triangle’ position, which can be viewed from all three sides, Dan Pearson (returning to RHS Chelsea Flower Show after more than a decade) created a representation of a small – less trodden - part of the 105-acre Chatsworth Garden. In line with Pearson’s passion for naturalism and the wilder side of gardening, the exhibit was inspired by Chatsworth’s ornamental Trout Stream and Paxton’s rockery. Planting reflected the lightness, freshness and delicacy of the 200-year old family owned Champagne House. The perfume industry in Grasse has been in decline for several years and many of the traditional plantations have become overgrown, but now with the support of ecologically-sensitive companies like L'Occitane, the industry is experiencing a significant renaissance. The garden was designed to reflect this with historic elements and a more naturalistic view to represent the history of the perfume industry, combined with an emerging, more tended feel that shows the present day growing importance of Grasse for perfume. The planting was designed to be aromatic, recreating the Provençal hillsides and the history of the perfume industry. It included Osmanthus, Iris, bergamot, lavender and thyme. Fig and rosemary hedges provided both scent and reflected their historical use for drying clothes and infusing them with their floral scent. Multi-award winning designer and TV Gardener Chris Beardshaw returned to the RHS Chelsea Flower Show with a garden for Morgan Stanley that formed an integral part of their international Healthy Cities initiative. A theatrical representation of 'community', the garden will be relocated after the show to form the centrepiece in a new community project in East London. This project builds on the firm’s 40+ year commitment to improving the health and wellbeing of children through philanthropic community involvement. The formal geometry of paths, hedges and walls symbolised the physical infrastructure of a community, while vibrant plants denoted the social elements within, as they are diverse in origin, colour and character but worked together to form a successful community. For the fifth year in a row, the Royal Bank of Canada returned to RHS Chelsea Flower Show, this time with a contemporary garden from Matthew Wilson which explored living sustainably through good design and understanding the importance of conserving fresh water. The garden was divided into three main parts; a zero irrigation ‘dry garden’, central water harvesting/storage zone, and edible garden, with a raised seating and dining platform. Matthew’s work on creating the Dry Garden at RHS Garden Hyde Hall and the RBC Blue Water Project was the inspiration for his garden. Based around a series of curved beds and features, the garden represented the ebb and flow of water, creating a sheltered sunlit space. Drought-tolerant and sun-loving trees, shrubs and flowers form the planting for the garden which also had a small pond. Designed by the 2014 BBC/RHS Chelsea People’s Choice winner Matthew Keightley, the garden celebrated the opening of the Mamohato Children’s centre in Lesotho, South Africa. Keightley designed the garden to aim to raise awareness of Sentebale’s work in providing healthcare and education to Lesotho’s most vulnerable children. The garden gave visitors a taste of Lesotho and the bright, vibrant atmosphere of the Mamohato camp, and included a rock and waterscape feature which was representative of the mountainous region in this part of South Africa. The garden also surrounded a building, constructed using traditional materials and methods, which represented the entrance building to Mamohato Children’s centre, offering further shelter and security to the vulnerable children Sentebale helps. Marcus Barnett designed a garden inspired by the De Stijl Movement. The garden reflected strong rectilinear geometry with coloured blocks, contributing colour and textural relief, whether viewed from in or out (or above) the garden. Contrasting colours and tones surrounded a series of differing scaled waterways. Trees and hedges introduced vertical detailing, sculptural form and dappled shade. Plants were selected to provide harmonious tonal balance and textural contrast within rectilinear planting spaces. Vibrant primary colours and closely related tones used by the De Stijl Movement were emphasised, with restful and balancing foils of green and white. The Viking Cruises garden celebrated the launch of Viking’s first ocean ship. It epitomised the elegant lines and style of this beautiful ship. The garden was designed to create a Scandinavian feel; clean and contemporary with a sleek finish. Movement was at its core, reflecting the graceful movement of a ship sailing through the rippling waters of great seas. Marking the 200th anniversary of Wellington’s victory at the Battle of Waterloo and Wellington’s College’s role as his living legacy, the garden progressed from the bleakness and brutality of the Battle of Waterloo 200 years ago, through to the greening and flowering of the landscape, and towards a representation of the iconic architecture of Wellington College, the memorial to the Duke of Wellington. The garden’s design reconciled the drama and violence of the battle with a progressive and positive future. Elements of the garden were inspired by the landscape and terrain of Waterloo, which Wellington used to his advantage, the battle formations that successfully repelled attack, the regimental colours of British and Allied troops, the eight aptitudes central to the teaching of the College, and the materiality of the College itself, marked with the personal carvings of current pupils and alumni.